Universities often use the word "diversity" to describe their student populations, programs and recruiting efforts as a way to attract new enrollees. But at Florida Atlantic University, diversity is more than a politically correct buzzword, and it goes beyond percentages and targets. It's a value and asset that both students and faculty believe enriches learning in countless ways, especially in the MBA programs. "Diversity is a given these days," says Ken Johnson, associate dean of FAU's graduate business programs. "In Southeast Florida, everyone's from somewhere else. If you look around at our students, you see so many people of different hues and accents." Indeed, the facts back up Johnson's observations. According to a 2014 report by the University of Southern California's Program for Environmental & Regional Equity (PERE), Southeast Florida ranks as one of the nation's most diverse regions. According to the report summary, "Communities of color are driving Southeast Florida's population growth, and their ability to participate and thrive is central to the region's economic success now and in the future." However, PERE statistics show that just 36 percent of African-Americans and 31 percent of Hispanic immigrants have access to high-opportunity jobs, compared to 55 percent of whites. Enter FAU with its commitment to buck the trend. 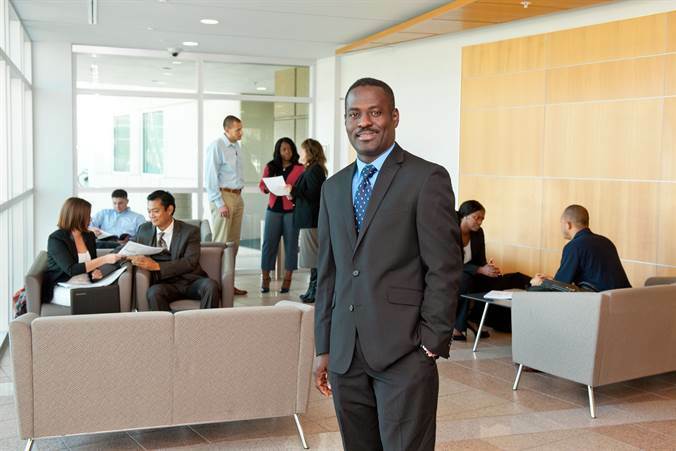 FAU's MBA programs create gateways for students across all races, nationalities and ethnicities to thrive by helping them seize new opportunities in the post-recession era. Half of the MBA student population is composed of minorities, while 40 percent of its Executive MBA and Professional MBA students were born outside the U.S., says Vegar Wiik, executive director of executive programs at FAU's College of Business. Other than the multicultural environment, FAU also stands apart in terms of gender diversity. Though the MBA degree is traditionally thought of as a white male bastion, FAU is close to achieving a 50-50 male-to-female ratio in its MBA programs. That outpaces recent worldwide gains: The Graduate Management Admission Council, which administers the GMAT exam (the test required for admission into graduate programs and that can represent the global business school pipeline), reports that women took 43.3 percent of the exams in 2014. There's one other way FAU succeeds in providing a diverse environment: Enrolling students of various ages and generations. While FAU's MBA programs do attract many adults returning to college after years in the workforce, the school also strongly encourages younger students to join the mix. And as their numbers grow, those students help foster and inspire FAU's diverse and inclusive atmosphere. "Millennials are all more connected and it's so much easier to understand that other person: You can look them up on the Internet, or communicate via social media," Johnson says. "With millennials, they don't worry about who you are or where you're from." Above all, though, the diversity of FAU's business school has much to do with how the faculty and staff can recognize students' unique needs, regardless of their race, ethnicity, gender, age or background, and assist them both in and out of the classroom. "Our students feel comfortable speaking with our staff. There is always someone here to help," says Megan Hall, assistant director of FAU's College of Business Executive Programs. "We provide a very friendly and comfortable environment for all students, so when they come to class it isn't always serious and stressful." Vivian Viteri, who is halfway to earning her MBA at FAU, says her fellow students contribute to that environment. "I've never felt intimidated or anxious with my peers in the program," Viteri says. "Everyone understands there is a level of professionalism and we're all treated as equals." She praises the university for its commitment to gender diversity—and the way it has helped mobilize her to break barriers. "Being an educated and independent woman makes me feel empowered," Viteri says. Since Day One, faculty and administrators have looked beyond the lecture halls to make sure the lively campus environment reflects the world off-campus. The endgame has always been about helping students recognize that FAU's MBA programs are far from the "boys club" of old.